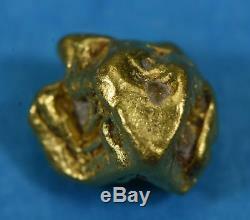 Australian Natural Gold Nugget Weighs 4.20 Grams. Most of my Australian nuggets come from Victoria's Gold Triangle area. Australian nugget are very high in purity running from 94-98% pure. All Nuggets are Pictured or Partially Pictured with a U. S Quarter which is 24.5MM in diameter to give you an idea of Size Proportion. Natural Gold Nugget Pioneering from the Australian plains, fields, & the tip of a metal detector uncleaned direct to your living room..... Through using my resources at the world number one Natural gold Jewelry Manufacturing shop once know as Conner's. The Details Behind Your Gold Nugget. What is a Natural Gold Nugget? It is a piece of gold that broke out of quartz deposits within the earth when erosion took place. It also goes by the name Placer Gold and each piece is a one of a kind with no two being exactly alike. Where can they be found? Wherever the effects of erosion took place. That would include rivers, streams, ancient dried up river channels and underground riverbeds. Gold nuggets range from 75 to 95 fine 18-23KT gold and can have other mineral content such as silver and copper mixed in with it. What sizes do they come in? Gold Nuggets come in all sizes, the smaller one range in sizes from 1 millimeter up to 6 and is often referred to as flakes. Bigger flakes are called nuggets and have been found as large as 2500 ounces although almost all nuggets bigger than 300 ounces were melted. How Are Natural Gold Nuggets found? They can be found in rivers and streams using a gold pan or suction dredges that act like an underground vacuum cleaner. Larger operations use large machinery that dig up huge sections of dirt weighing several tons and run it through machines that separate the gold from the dirt. The larger the nugget the more rare and valuable they are. A one-ounce nugget is now considered as rare as a five-carat diamond. How many of those do you own? Why are some real bright and others dull? Because it was formed underground in quartz deposit you often find quartz mixed in with it. When they broke off into the rivers and streams they tumbled against the sand and gravel, which gave the nuggets, it's texture but dulled it. They can be cleaned in different solutions, and then tumbled in different media to give it the shine. What do we mean by Authentic, Genuine, Natural Gold Nuggets? Natural Gold Nugget Pioneering from the Australian plains, fields, & the tip of a metal detector uncleaned direct to your living room...... Passion- Legacy-Experience - In November of 2013 I opened up my Gold Nugget store. With thousands of satisfied customers I will continue to strive to provide the highest quality, largest selection and best priced gold nuggets on. Through using my resources at the world number one Natural gold Jewelry Manufacturing shop once know as Conner's Jewelers and now the company Orocal. Each nugget comes with a. Certificate of authenticity guaranteeing it to be genuine. Natural Gold Nugget Pioneering from the Australian plains, fields, & the tip of a metal detector direct to your living room...... In November of 2013 I opened up my Gold Nugget store. My Source for Australian Gold Nuggets for Sale the GoldenTriangle. Except for the richer and more extensive gold-bearing fields of California, the gold production in the State of Victoria was once greater than in any other country in the world. The state's greatest yield within a single year occurred in 1856; where a documented recovery of 3,053,744 troy ounces of gold was achieved. According to the Victorian Mines Department, the state had produced over 60-million ounces of gold between 1851 and 1896. At Walhalla alone, Cohens Reef produced over 1.6 million troy ounces of gold within 40 years of mining. While traces of gold were earlier found during the 1840s, particularly in the Port Philip area, and its later discoveries at Warrandyte, Clunes and Buninyong in 1851, the intensive gold rushes really started near Ballarat, at Golden Point, including the significant gold finds in Bendigo and Beechworth. At the height of its gold production, Victoria channeled an average of two tons of gold weekly into the Treasury Building in Melbourne. The exported gold to Britain during the 1850s greatly compensated Victoria's entire foreign debts and eventually laid the foundation of the state's large commercial expansion towards the latter half of the century. Originally, the first discovery of gold in Victoria was made by the Hon. Campbell, when he found several small pieces of native gold in quartz at Clunes, in March of 1850. However, the discovery was kept secret and only became official when Campbell revealed the find on January 10, 1851. The third discovery was made by Mr. Thomas Hiscock, who found a deposit in the gully of the Buninyong Ranges on August 8, 1851. On July of 1851, Thomas Peters discovered specks of gold at what is now known as Specimen Gully. The discovery triggered a rush to the Mount Alexander area. In November of the same year, gold was found at Forest Creek centered on present-day Castlemaine. It marked the beginning of the largest of all Victorian gold discoveries and claimed as the richest shallow alluvial goldfield in the world. By December, further discoveries followed, with even more gold found in the area now known as Bendigo. Within just a few decades, Victoria transformed from a small pastoral settlement to a wealthy and proud colony as goldfields sprouted and stretched from Ararat and Stawell in the western districts to Beechworth, Daylesford and Ovens River to the northwest in 1852; Bright, Omeo, and Avoca towards the mountainous regions during 1858-59; and, Walhalla in 1863. However, these discoveries were soon surpassed by the Ballarat and Bendigo finds. In November 1906, a remarkable discovery of gold was made near Tarnagulla, where a miner who had patiently prospected the area for a long time recovered seven ounces of gold from a shaft nineteen feet deep, including some fairly large nuggets. This find sparked the so-called Poseidon rush. The final principal gold rush in Victoria occurred at Berringa, south of Ballarat, during the first decade of the 20th century. Still, gold has continued to be found in recent years with the latest discovery at Wedderburn in 1980. Eventually gold mining slowed in Victoria. It was largely due in part with the high costs of pumping and mining in greater depths, but not because the goldfields have been exhausted completely. The recent increase in gold prices has seen a resurgence of commercial gold mining with operations resuming in the major fields of Ballarat and Bendigo. Further explorations is also underway elsewhere, like in the isolated mountain area of Glen Wills near Mitta Mitta in the northeastern region. Miners are still finding Gold with metal detectors by hand in fields. The item "#971 Australian Natural Gold Nugget 4.20 Grams Genuine" is in sale since Sunday, December 9, 2018. This item is in the category "Coins & Paper Money\Bullion\Gold\Nuggets". The seller is "nuggetsbygrant" and is located in us. This item can be shipped to United States, Canada, United Kingdom, Denmark, Romania, Slovakia, Bulgaria, Czech republic, Finland, Hungary, Latvia, Lithuania, Malta, Estonia, Australia, Greece, Portugal, Cyprus, Slovenia, Japan, Sweden, South Korea, Indonesia, Taiwan, Thailand, Belgium, France, Hong Kong, Ireland, Netherlands, Poland, Spain, Italy, Germany, Austria, Bahamas, Israel, Mexico, New Zealand, Philippines, Singapore, Switzerland, Norway, United arab emirates, Qatar, Kuwait, Croatia, Malaysia, Chile, Colombia, Bolivia, Ecuador, Egypt, Guadeloupe, Iceland, Sri lanka, Maldives, Oman, Peru, Reunion, Viet nam, Uruguay.